A German court has ruled that Carles Puigdemont can be released on bail until a decision on his extradition to Spain is made. The corruption charge against him is a potential basis for his return to Spain. The state court in Schleswig ruled on Thursday that there was no reason to believe Catalonia’s former leader Carles Puigdemont risked persecution in Spain. It set bail at €75,000 ($92,000) pending a decision on his possible extradition to Spain. In a heavy blow to the Spanish government, the court in northern Germany ruled that the main charge of rebellion against Puigdemont could not be used as grounds for extradition, since the comparable German charge of treason specifies violence. The court will therefore consider his extradition on the basis of the lesser charge of misuse of public funds. Puigdemont can leave prison as soon as he posts the bail, a court spokeswoman said on Thursday. 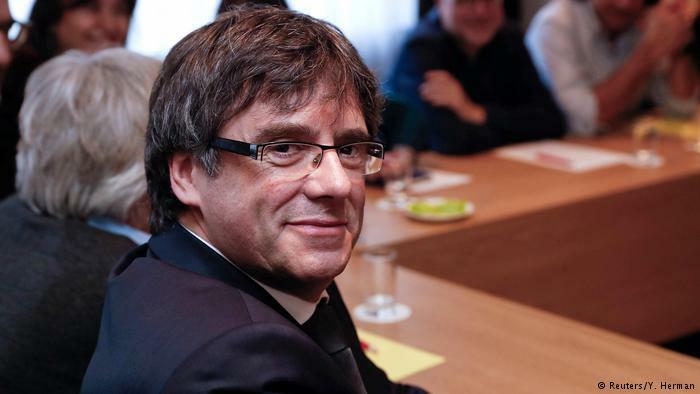 The former Catalan separatist leader was detained in Germany last month on an international arrest warrant issued by Spain when he was driving back from Finland through Denmark on his way to Belgium. He had been living there after being charged by Spanish authorities with rebellion and misuse of public funds in last year’s Catalan independence referendum, which the Spanish central government deems to have been illegal. Catala added that the government would wait and see whether the German prosecution would launch an appeal. In addition to the payment, the terms of Puigdemont’s bail are that he may not leave Germany; he has to advise if he changes address; he has to report to the court once a week and must obey orders from the Higher Regional Court.